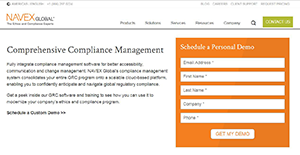 NAVEX Global is a comprehensive, cloud-based compliance management software suite. The program consolidates the entire Global Regulatory Compliance (GRC) program onto a reliable platform for change management, better accessibility, and streamlined communication. It integrates modules which include: EthicsPoint Incident management, Policy management, Third party management, compliance online training solutions to deliver a unified program. The modules are designed to be flexible and scalable to make compliance and ethics program easier to measure and manage. The solution helps businesses to manage risk intelligently while harnessing the competitive edge of compliance. It provides great, organization-wide visibility that enables managers to highlight and handle risk proactively. Users have the freedom select the full suite or a single solution depending on their business needs. NAVEX Global provides an all-inclusive suite of established compliance and ethics solutions and training to help organizations to manage compliance risk. The solution helps repel compliance risk amidst the steady stream of rapidly developing internal and external compliance risks. It provides innovative tools that enable organizations to protect employees, reputation, and the bottom line. This makes it easy for businesses to maintain a buoyant, ethical organizational culture. One notable module in the NAVEX Global ecosystem is the Incident Management Software. This solution helps you capture and scrutinize ethics and compliance reports in a centralized database. It provides reliable web intake forms, hotline services, and face to face conversation to collect all impeding issues. Issues can also be highlighted using concerns raised via questioners from the PolicyTech management system. The PolicyTech is another robust module that automates key tasks and gives employees easy access to policy and procedures. It enables organizations to run audit-ready reports, manage risk across its departments, and keep all documents up to date to improve efficiency. The RiskRate module provides robust tools for enterprise due diligence and third-party risk management program. It enables organizations to execute risk-based, third-party risk management system with consolidated screening, onboarding, and steady monitoring. The compliance online training sets the standards and keeps employees updated on what is expected of them. This introduces and maintains a culture of ethics and aligns all teams to the ethics codes. If you are interested in NAVEX Global it may also be sensible to analyze other subcategories of Best Business Process Management Software listed in our database of B2B software reviews. It is crucial to realize that almost no service in the Business Process Management Software category is going to be an ideal solution that can meet all the requirements of various business types, sizes and industries. It may be a good idea to read a few NAVEX Global reviews first as specific solutions may dominate exclusively in a very small group of applications or be created with a very specific type of industry in mind. Others might operate with an idea of being simple and intuitive and therefore lack complex features needed by more experienced users. You can also find services that cater to a wide group of users and provide a powerful feature set, but that usually comes at a more significant cost of such a software. Make sure you're aware of your needs so that you pick a solution that has all the elements you search for. How Much Does NAVEX Global Cost? NAVEX Global provides no detailed pricing information. However, their pricing is based on the number of staff and other intake needs. Contact the company for more on pricing details. We realize that when you make a decision to buy Business Process Management Software it’s important not only to see how experts evaluate it in their reviews, but also to find out if the real people and companies that buy it are actually satisfied with the product. That’s why we’ve created our behavior-based Customer Satisfaction Algorithm™ that gathers customer reviews, comments and NAVEX Global reviews across a wide range of social media sites. The data is then presented in an easy to digest form showing how many people had positive and negative experience with NAVEX Global. With that information at hand you should be equipped to make an informed buying decision that you won’t regret. What are NAVEX Global pricing details? What integrations are available for NAVEX Global?